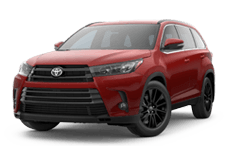 If you're looking for the same style of versatility and power as the 2016 Toyota Highlander but want to be eco-friendlier and economical on gas, then consider the 2016 Toyota Highlander Hybrid. Come to Toyota of Fort Walton Beach and test drive the latest 2016 Highlander Hybrid. Located at 1006 N. Beal PKWY, Fort Walton Beach, FL, Toyota of Fort Walton Beach serves Pensacola, Panama City, Wright, and Navarre, FL. The 2016 Toyota Highlander Hybrid has an MPG Rating of 27 City / 28 HWY. Features include projector0beam halogen smoked-chrome-accent headlights, daytime running lights, Hybrid Synergy drive, Color-keyed heated power outside mirrors, power tilt/slide moonroof with sunshade and jam protection, panoramic moonroof with power sunshade, 19" alloy wheels, black front/ rear mudguards, UV reduction glass on all windows, privacy glass on rear side, and chromtec roof rails. The 2016 Highlander Hybrid comes equipped with a 280 Hybrid net HP 3.5L V6 Double Overhead Cam engine with ultra-low emission. Standard safety features include front / side airbags, Star safety system (Vehicle stability control, traction control, anti-lock brakes system, electronic brake-force distribution, brake assist, smart stop technology), downhill assist control, lane departure alert with auto high beam, blind spot monitor, pre-collision system, rear parking assist sonar, Child-protector rear door locks, Tire pressure monitor systems, and Toyotacare roadside assistance. In addition to the safety features, the 2016 Highlander has an impressive list of interior features as well! Features include air conditioning with air filter, backup camera, 8" Touchscreen Display with AM/FM CD player, six speakers, USB 2.0 port, auxiliary audio jack, ECO/ Sports Mode, 4.2" LCD multi-information display, Auto-dimming rearview mirror, cruise control, leather-trimmed shift lever with silver accents, 6-way adjustable driver seat, fabric and softex-trimmed front and second row seats with 60/40 split seating, dynamic radar cruise control, Optitron instrumentation with blue-illuminated speedometer and tachometer, soft-touch upper door trim with metallic accent, leatherette-trimmed door armrest area with satin chrome interior door handles, rear liftgate defogger, power windows, power locks, cargo area with tonneau cover, remote keyless entry system, smart key system with push button start, illuminated entry system, eight cup holders, Auto-dimming rearview mirror, three 12V auxiliary power outlets, one 120V auxiliary AC power outlet, digital clock, and dual sun visors with vanity mirrors and extenders. The Highlander Hybrid has everything you will need! 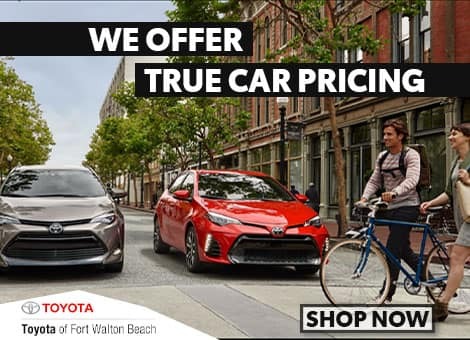 At Toyota of Fort Walton Beach you'll find exceptional sales representatives who are attentive to their clients. 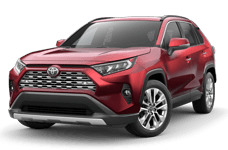 Toyota of Fort Walton Beach has friendly sales staff standing by ready to assist you in attaining the latest and greatest 2016 Toyota Highlander Hybrid! Located at 1006 N. Beal PKWY, Fort Walton Beach, FL, Toyota of Fort Walton Beach serves Pensacola, Panama City, Wright, and Navarre, FL.